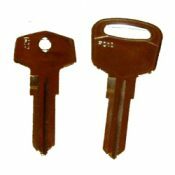 A key for TVR cars manufactured between 1963 and 1996 cut to number or photo. There may be additional key number formats to those listed above. If you have your key number, please fill in the details below. A laser key cut to key number for TVR cars manufactured before 1995. We do not use original TVR blanks, we use high quality steel blanks manufactured by Silca.